Great movies are made with memorable characters. Memorable characters are built by talented artists. Terrence has helped create some of the most memorable characters for a decade and a half, supervising teams of visual effects artists. Below are some of those characters that have starred in movies such as Spider-Man: Into the Spider-verse, Spider-Man: Homecoming, Storks, Oz The Great and Powerful, Hotel Transylvania 2, The Smurfs, and Alice in Wonderland. 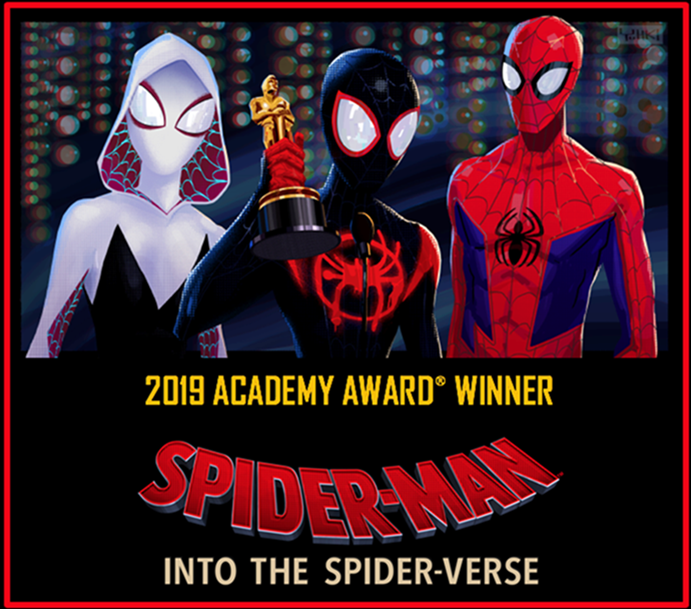 Spider-Man: Into the Spider-verse has won the 2019 Golden Globe and 2019 Oscar for Best Animated Feature Film! When we started the initial look-of-picture test, we knew we were on to something special. This was something that was a vast departure from any other feature animated film, a graphic comic book style. As a Character Setup Supervisor, I was tasked with guiding a team that built the puppets for the animators. We needed to make anatomic characters much like a live-action film, but still able to achieve a stylized look. They also needed to support the extreme poses that the animators needed to hit. Working closely with the animation and visual effects supervisors, I started with Peter Parker in his Spider-Man suit, the basis for all characters in the film I designed a new system that simulated the action of real muscles, but worked on the puppet the animators were using so they could see the results as they worked. I personally built the puppets for Peter Parker, Spider-Man, Wanda, Spider-Gwen, and Uncle Aaron. I have since adapted this system for the up-coming live-action Spider-Man: Far From Home. The characters I create are puppets, the only difference from classic puppets being that they exist in a computer.To create one, a model is created in a default pose. Then I create a skeleton, using real animal anatomy as a reference. To make it move believably, I apply various "deformers", which are complex software algorithms that bind the model to the skeleton. This is just a baseline, since we want the character to deform as if skin was being moved by underlying muscle. I pose the character in many positions, evaluate the quality of the deformation, and then sculpt the character till it looks correct in each of those poses. In the end it has to look like it is real. Cartoony or other magical characters won't deform as if they have muscles, but the technique is the same to get the look that the director wants to achieve. Finally, I add all of the controls that the animators need to bring it to life. Below are clips from the movies showing my characters in action. Here is my latest "showreel", which basically is a highlight reel of the work I have done for all of the feature films. Spider-Man:Homecoming was a demanding film to work on, but very rewarding as the final imagery looks fantastic! I built the digital-double rig for Spider-Man in the home-made suit, the Vulture's wings (a crazy complex rig) and the cargo plane. Our work is in the big Spider-Man vs Vulture fight at the end of the movie. Below is a short video that Imageworks put together showing how we created the CG stunt-double for Spider-Man in his home-made suit. I rigged the body of the character, hand-sculpting the muscle and bone in many poses to make it look believable when in motion. When we first showed our test footage of the CG character, the director and the actor Tom Holland thought we were showing them test footage of Tom in the suit. They were very surprised that it was actually all CG. This is a trailer for my latest project, Storks. I am leading the team that is still hard at work building the characters and props. The characters are a blast to create and the story is a lot of fun, I am excited to show it to everyone. The next video focuses in on shots of the rig I created for Finley, the flying monkey, starring in Oz, the Great and Powerful. I built him while working at Sony Pictures Imageworks as Character Setup Lead. I setup the body rig and deformations. I also created the wing rig to mimic the operation and deformation of bird wings. The rig gave the animators full control over the broad shape of the wings while still retaining the characteristics of real wings, like separation of the primary and secondary feather groups. This allowed the wing to fold up properly and compactly using only a few main controls. It also keeps the feathers layered properly while still providing full control for the animators, when they need it. If you enjoy seeing these fantastical movie characters, take a look at the other fantasy characters I am creating in my sculpture section.